Nuri Mehmud, an official representative of the Kurdish People’s Protection Units (YPG), said in an interview with Sputnik Turkey that the group will defend its territories if there is an attack on Afrin from Turkey. According to Mehmud, there is active military activity of the Turkish armed forces on the Syrian border in the area of Afrin. The Turkish troops and military equipment are being drawn at present and it seems that the Turkish troops are preparing to carry out an operation in Afrin, the representative said. “Turkey has deployed its military and equipment on the Syrian border near the Aazaz and Mare region. This activity is taking place because Turkey is preparing to attack Tel Rifat and Afrin,” Mehmud said. He further said, “Turkey wants to establish control over these areas and strengthen its influence there. We intend to protect our territories and repel the attack no matter where it comes from,” the representative concluded. Earlier, YPG Commander Sipan Hemo said that Syrian Kurdish militia does not recognize the Turkish "invasion" to the north of Syria and will "liberate" that part of the country. "We don’t accept the Turkish state’s presence or invasion in this region in any form. I want to stress that we don’t recognize their alliances either. Our goal and struggle to liberate the Azaz-Jarablus area will continue," Hemo said, as quoted by the Firat news agency. Meanwhile, top Turkish officials criticized the US’ decision to supply weapons to the Kurdish People’s Protection Units (YPG) to fight jihadists in Syria. 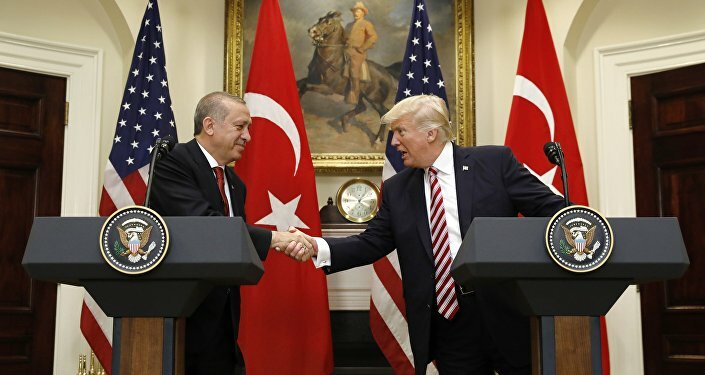 "It has been emphasized that the implementation of a policy to support the PKK/PYD-YPG terrorist organization in the guise of the Syrian Democratic Forces (SDF), ignoring Turkey’s expectations, does not befit a friendship and alliance," the council said after a meeting held on late May 31, as quoted by Hurriyet Daily News. Kurds are the largest ethnic minority in Turkey, Iraq, and Syria. In Iraq and Syria, the Kurds are fighting against Daesh (ISIL terrorist group). An estimated 50,000-strong YPG is the armed wing of the Kurdish Democratic Union Party (PYD). Turkey insists the YPG is linked to the Kurdistan Workers' Party (PKK), which has been in an armed conflict with Turkey for more than 3 decades and is listed as a terrorist organization by Turkey, the United States and the European Union.